Information posted in public forums, community discussions, message boards and other interactive online features. LeagueHeads offers certain third-party social networking services through the Site. For example, you can use a third-party social networking service, such as Facebook, to share information about your experience on the Site with your friends and followers on such service. 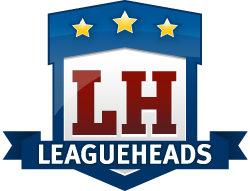 A social networking service may be able to collect information about you, including about your activity on the Site, and it also may notify your friends, both on the Site and on the service itself, that you are a LeagueHeads user or about your use of the Site, in accordance with applicable law and its own privacy policies. We use your personal information to enhance the operation of this Site and allow you to use all of its features. We only use payment and identity verification information, such as credit card numbers, as necessary for completing a particular transaction or as otherwise required by law. We may allow advertisers to display ads on this site that solicit, or contain technology to collect, information about our users. This information is collected and used by our advertisers, and is outside of our control. If you have any questions about a banner advertisement, you should contact the responsible advertiser directly. Although LeagueHeads does not currently sell, lease, or otherwise share your information with third parties for purposes unrelated to this Site, we reserve the right to do so in the future. We are committing to ensuring your understanding of when we may share information collected about you and with whom we may share it. With your consent, we may share your contact information with third-party business partners. We may share your information with third-party vendors who help us with certain specialized services, including customer support, business analytics, marketing, and data processing. These third parties are allowed to use your information to help us provide our services and not for any other purpose. We may disclose information about our users, including contact information, to respond to subpoenas, court orders, legal process, and other law enforcement measures, and to comply with other legal obligations. We may disclose information to protect and defend the legal rights, interests, and safety of the Site, and our employees, agents, and contractors (including enforcing our agreements); to protect the safety and security of users of the Site and members of the public; and as otherwise disclosed in the Terms & Conditions. We also may share aggregated or anonymized information with third parties, including to help us develop new content and services for our users or to help these third parties develop their own products and service offerings. This sharing of anonymized or aggregated information will not include information that could be used to individually identify you. You can choose to enjoy content and features on Site without directly providing us with any information about you; however, as described above, some information may passively or automatically be collected or may be requested so you can take advantage of certain features and services offered on the Site. You can opt out of receiving commercial email or other messages from the Site or service by following the instructions contained in any such message. Please note that even if you unsubscribe to commercial messages, we still may need to send you communications relating to your use of the Site, such as service announcements. We want to be sure that we keep only the most accurate and up-to-date information about you in our records. If you choose to share personal information with us, you may have the opportunity to update that information on the Site. You also may update or amend your information by contacting us at support@leagueheads.com. If you ask us to shut down your account or delete your information, we will disable your account within a reasonable period of time. Please note that we may need to retain some information about you in order to satisfy our legal and security obligations. Please also note that if you used a third-party social networking service to access the Site, we will not be able to shut down your third-party networking site account or delete any information collected by that social networking service. In some cases, you may be entitled under local laws to access or object to the processing of information that we hold relating to you. We are committed to protecting your information. We have adopted commercially reasonable technical, administrative and physical security measures to help keep your information as secure as possible. However, please note that no data transmission or storage can be guaranteed to be 100% secure and we cannot ensure or guarantee the security of any information you transmit to us. Residents of the State of California may request a list of all third parties to which the Site has disclosed certain information during the preceding year for the third parties’ direct marketing purposes. If you are a California resident and want such a list, please contact us at support@leagueheads.com. For all requests, you must put the statement “Your California Privacy Rights” in the body of your request and include your name, street address, city, state, and zip code. Please note that we will not accept requests via the telephone, mail, or by facsimile, and we are not responsible for notices that are not labeled or sent properly, or that do not have complete information. This Site is not intended for children under the age of 13. We do not knowingly collect information from Site visitors under the age of 13. If we obtain knowledge that we have personally identifiable information about a child under 13 in retrievable form in our files, we will delete that information from our existing files.